11 Usk Lady Hill at Twyn Square, Usk01633 644850work Walking RouteThis is a short but varied walk through farmland and woodland to the north of Usk. It loops north east through rolling hills and woodland towards Gwehelog before turning south west to follow Cwm Cayo - a small valley back to the River Usk. You then follow the route of the old railway to the Old Station before the path continues to Usk Castle and rejoins the outward route. This is a short but varied walk through farmland and woodland to the north of Usk. It loops north east through rolling hills and woodland towards Gwehelog before turning south west to follow Cwm Cayo - a small valley back to the River Usk. You then follow the route of the old railway to the Old Station before the path continues to Usk Castle and rejoins the outward route. Points of interest include Usk Castle, Pwll Melyn Battle Site, Usk Station tunnel. Public toilets in Maryport Street car park, shops, cafes and pubs in Usk. 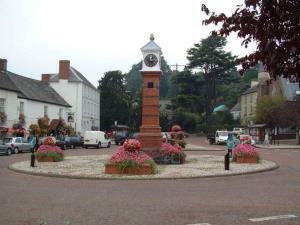 Shops, cafes and pubs in Usk.